One of the movement’s leaders, Mark Meckler, was once a top operator in a company accused of conning consumers. Is he applying the same tactics to the tea party? It’s certainly an inspiring metaphor. If one tentacle is chopped off, the starfish grows a new one, making it a model of resilience. Yet there’s another type of organization that’s resilient, decentralized, and reminiscent of the Tea Party Patriots, a national umbrella organization that claims to represent 15 million activists and 2800 local affiliates. You can find it in companies like Amway, Herbalife, and others that rely on what’s known as multilevel marketing (MLM), a business model some consider to be nothing but a pyramid scheme. Like the tea party movement, these companies also operate as “leaderless,” grassroots organizations. Organized by “networks,” they espouse a bottom-up approach and depend on a neverending supply of people willing to work long hours with no assurance of pay. Meckler, it turns out, is intimately familiar with these types of outfits, having spent years at the highest ranks of one accused of preying on consumers with promises of easy money. The company has a long history of run-ins with state and federal regulators, as well as congressional investigators, for its business practices and products. As early as 1982, the Food and Drug Administration sent Herbalife a notice of adverse findings for falsely claiming that its nutritional products could cure pretty much any disease. As a result, the company ended up removing questionable ingredients from some products and promised to modify the claims that it made in sales materials. The FDA also received a host of complaints from consumers about noxious side effects from Herbalife’s products as well. A few years later, in 1985, the state of California sued the company for making false claims about its products and for running a pyramid-style marketing scheme. Herbalife settled the case for $850,000 without admitting wrongdoing. Becoming successful in Herbalife requires a certain ability to both persuade and suspend disbelief, given the need to recruit ever more distributors rather than simply sell weight-loss shakes. Herbalife distributors sell “opportunity,” relying on a prospecting pitch that emphasizes the financial and personal freedom available to anyone who joins the business. Meckler was fluent in the pitch. In July 1999, he and his wife, Patty, wrote an article for Upline Magazine, a trade publication for “network marketers,” that came right off the Herbalife script. They claimed that MLM work can provide a “lifestyle offering total time freedom” and an opportunity to build an “unlimited residual income stream.” Meckler, who lists the Dale Carnegie-inspired motivational book Think and Grow Rich as a favorite on Facebook, advised readers looking for new prospects to get out there and hit up some lawyers like himself. “Don’t be timid!” he coached. While the Mecklers might have found great health benefits in the Herbalife products they were selling, dozens of people sued Herbalife alleging that its supplements had caused deaths, strokes, and heart attacks. That’s because Herbalife was one of the biggest sellers of “natural” products made with ephedra. The herb is similar to the chemical ephedrine, an appetite suppressant and drug often used as an asthma treatment. It’s not too different from amphetamines. The dangers associated with ephedra, and the ensuing lawsuits, prompted many insurance companies to jack up the rates or drop companies like Herbalife that sold it. The Mecklers claimed to be averaging more than $20,000 a month from their Herbalife business, which they said was giving them “newfound freedom” to be better parents and to spend more time with friends. In mid-2002, the company reported that because of the wrongful death suits pending against it and the problems with ephedra, the company’s liability insurance premiums had jumped from $400,000 a year to $2.5 million a year, a move that ultimately prompted Herbalife to quit selling ephedra products soon after. In 2004, the FDA banned ephedra’s use in supplements because of the reports of adverse affects. Still, Meckler’s business didn’t seem to suffer from the bad publicity. In the 2002 magazine profile, the Mecklers claimed to be averaging more than $20,000 a month from their Herbalife business, which they said was giving them “newfound freedom” to be better parents and to spend more time with friends. “In this business, if you focus on taking care of people and helping them, the check will come and so will everything else you are trying to accomplish,” Mark said. Not everyone drawn in by the Herbalife pitch was quite as successful. In 2004, the company paid $6 million to settle a class action suit filed by 8,700 Herbalife distributors who alleged the company was a pyramid scheme. (Meckler was not named in the suit.) According to the lawsuit, many of the people induced to join up lost between $10,000 and $50,000; some were even forced into bankruptcy. Meckler hasn’t been an Herbalife distributor since 2004, according to the company, but he didn’t stray far. Since at least 2007, he has worked as the general counsel and chief operating officer of UniqueLeads, a Florida-based company owned by Shai Pritz, another member of Herbalife’s president’s team. The company provides marketing and “lead generation” services to companies like Herbalife. Through a network of “affiliates”—usually web publishers, bloggers, or anyone who can put up a website—the company helps place ads across the Internet as a way of generating contact information lists for sales and other pitches. The firm has offered its affiliates the chance to place ads for organic hair growth products, colon cleansers, acai berry weight loss products, various “credit repair” sites, a teeth whitener, work-from-home offers, and even one for a dietary supplement that promises “slow down the aging process” and help you lose weight, too. Pritz also owns UniqueLists, a data management company that sells the contact information harvested through the online ads. Meckler’s job, apparently, has been to keep UniqueLeads out of trouble with regulators through an in-house “compliance” program. Before he made his first public speech at a tea party event in 2009, Meckler was speaking at affiliate marketing conferences and writing advice columns on how to avoid run-ins with the law. In one column Meckler wrote in a trade publication, he warned affiliate marketers that the FTC was poised to crack down on companies that tricked people into giving up contact information and credit card numbers online with offers of “free” stuff that wasn’t free at all. “After the FTC contacts you, it’s too late, and the FTC is going to extract their pint of blood, in addition to forcing you to comply,” he wrote. Few of the tea party activists I spoke with for this story seemed to know what Meckler does for a living or about his work for Herbalife. 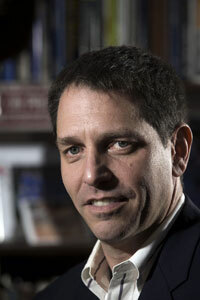 (UniqueLeads.com owner Shai Pritz wouldn’t comment on Meckler’s work for his company, but Meckler still maintains a voicemail box there, and when I called his UniqueLeads office number in mid-October, a woman answered: “Mark Meckler’s office.”) Many have assumed that he was devoting all of his time to the tea party, largely because earlier this year he sent out an appeal to local tea partiers pleading poverty and asking for money. Meckler’s professional experience in the world of multilevel marketing seems to have translated quite well into the tea party movement. The solicitation apparently raised some cash for the Mecklers, even while raising some eyebrows among local activists who, even without knowing about his MLM background, have begun raising red flags about what they see as Meckler’s keen interest in the tea party movement’s one real asset: its contact database. It’s loaded with the names of highly politically engaged people who might be inclined to donate money to candidates—or, more cynically, people susceptible to conspiracy theories who might be interested in buying some overpriced gold, or perhaps a too-good-to-be-true weight-loss pill. Meckler came under fire earlier this year when news broke that, in 2007, UniqueLeads had spun off another company called Opt-In Movement, in conjunction with a DC-based GOP consultant David All, to create a list-generation firm that catered to political campaigns. (All declined to comment, and the company appears to be inactive.) Tea party activists seized on the story as a sign that, far from being the grassroots activist Meckler claimed to be, he was actually an aspiring GOP consultant. Concerns over Meckler’s intentions have also surrounded a $1 million anonymous donation recently received by the Patriots, which the group is divvying up via grants to its local affiliates. The grant criteria placed a high value on applications from groups that got a lot of members to register on the national TPP site, which meant turning over significant personal information. While distinctly non-starfish-like organizations like Tea Party Express, which is run by a California GOP consulting firm and much maligned by Meckler for not being grassroots enough, have made a significant impact on elections in Delaware, Massachusetts, and Alaska, TPP has remained above the electoral fray. Though it formed a political action committee, and the midterm elections are quickly approaching, federal election records show that the PAC has never raised any money, nor has it endorsed any candidates. TPP is urging supporters to erect yard signs across the country to “brand” itself and will hold some get-out-the-vote rallies in the run up to the midterms. But its main claim to fame is really the size of its network, not anything the network has actually accomplished. Nonetheless, the Tea Party Patriots is “moving to the next level,” as they say at Herbalife. In late September, its top organizers met with a secretive group of far-right movers and shakers to make a fundraising pitch for the group’s multi-million-dollar “40-year-plan” to change the country. The group, the Council for National Policy, is funded heavily by the DeVos family, the owners of Amway, one of the largest MLM companies in the country. According to the TPP fundraising memo, the money would fund more rallies, to recruit more activists, to fund more rallies, to recruit more activists, to fund more rallies. A condensed version of this story appears in the January/February 2011 issue of Mother Jones.